Brilliantly simple and mouth watering dish. Do not over cook the king prawns. Prepare the raw prawns by removing their shells and the black vein that runs down the back. Make a small cut the length of the prawn to remove the vein and open up the prawn when it’s cooked. Wash the prawns in water. Heat the oil in a frying pan over a high heat. Add the garlic and chilli and cook for 1-2 minutes. Then add the prawns, sugar and sea salt, cooking quickly for no more that 1-2 minutes. 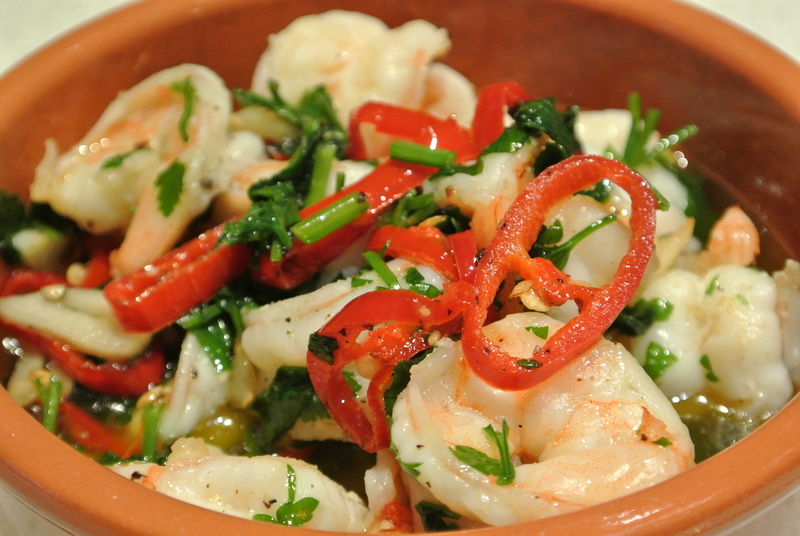 Stir in the parsley and serve in warmed dishes with lemon wedges. Use small fresh water prawns instead of the raw king prawns but just cook for 1 minute at the same stage.